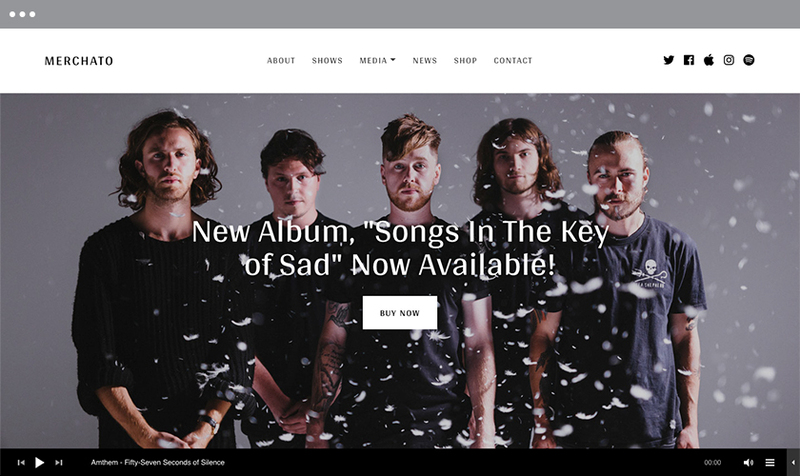 A unique, mosaic inspired WordPress theme for creating the engaging, media-rich content required for band and musician websites. Merchato integrates seamlessly with the number one eCommerce plugin on the planet, WooCommerce. 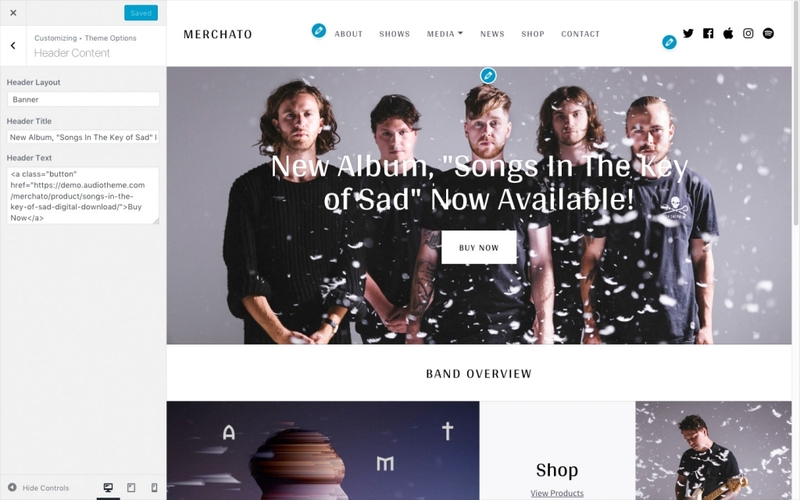 Merchato integrates seamlessly with WooCommerce, a free, extendable eCommerce plugin that helps you sell your music, merch, or downloadable products straight from your own website. Setting up your shop is as easy as activating WooCommerce and going through the quick setup. Once you’ve done that, you can start adding products and selling them to your fans. Add a custom menu to your shop pages for full control over additional links to shop categories, pages, products, or custom links. Optionally, display a draggable price filter to filter results within a specific price range. Don’t forget to feature products, product categories, or the shop page on the homepage of your site for additional product placement and exposure! Individual product pages showcase large product images or image galleries. Fans can view product details, customer reviews, and add items to the cart for checkout. 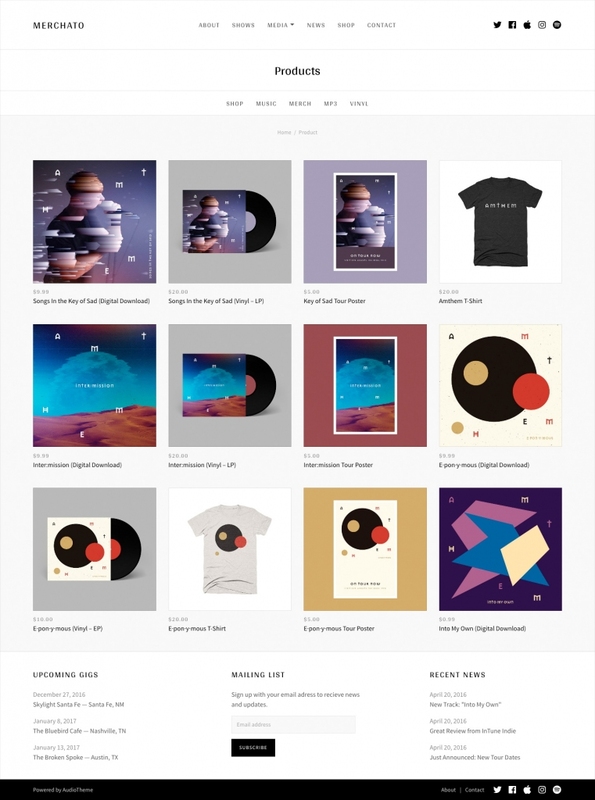 To ensure a beautiful, cohesive style across your entire site, we’ve added our attention to detail to every aspect of WooCommerce; from the shop and product pages to the customer account area. Display a list of upcoming gigs to let your fans know where you’ll be playing along with additional purchase links and gig details. The list automatically updates to keep your next date at the top of the list. Optionally, display past gigs or link to yearly gig archives using a custom menu. Each gig has its own page, allowing you or your fans to easily share links via Facebook, Twitter, email, and other social media networks. 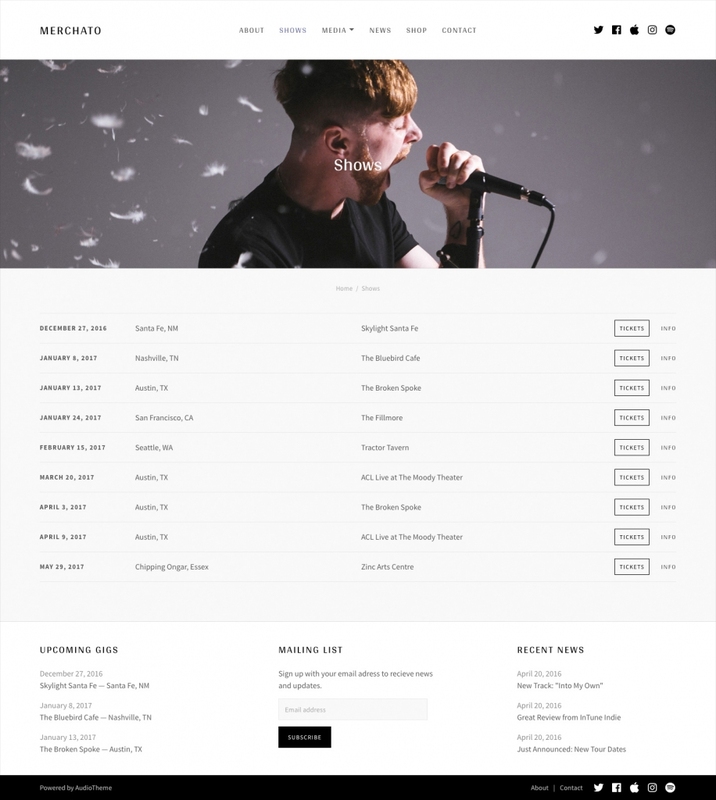 Individual gig pages display time, date, venue details, ticket information, calendar links, and more. 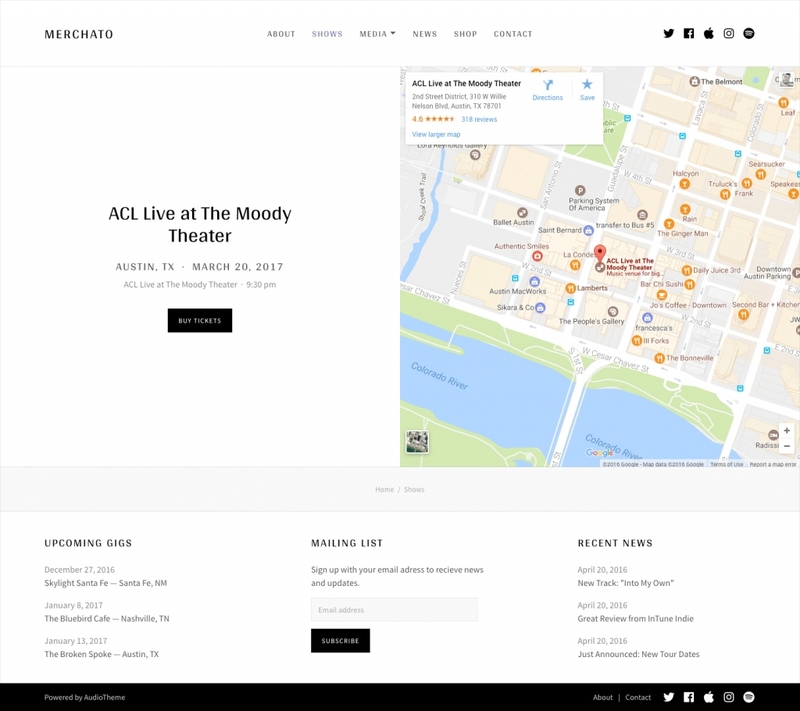 Gig maps are automatically embedded based on the address of the gig venue and link to Google Maps for additional details or directions. 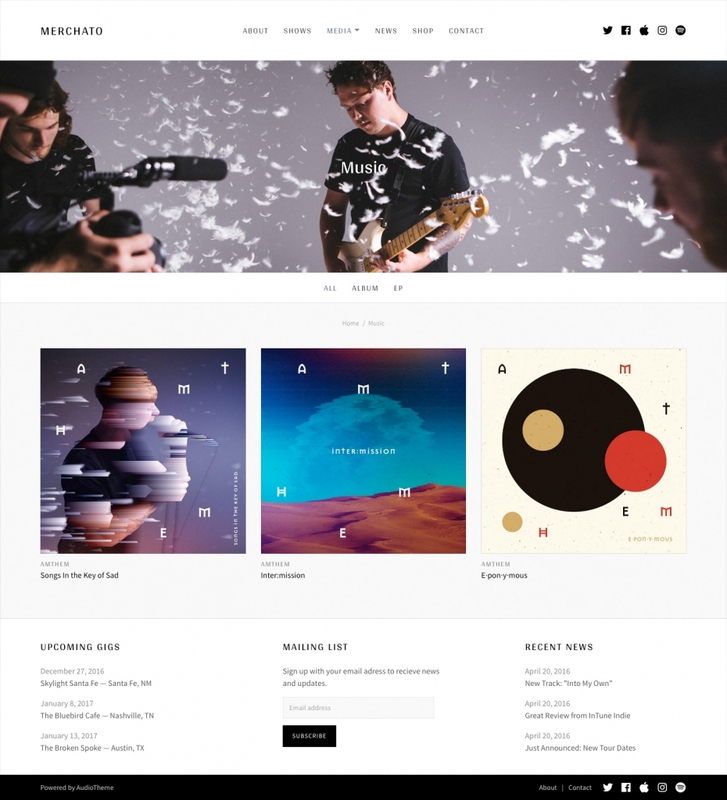 Upload cover images and assign titles and tracks. Everything you need to build your discography is at your fingertips. 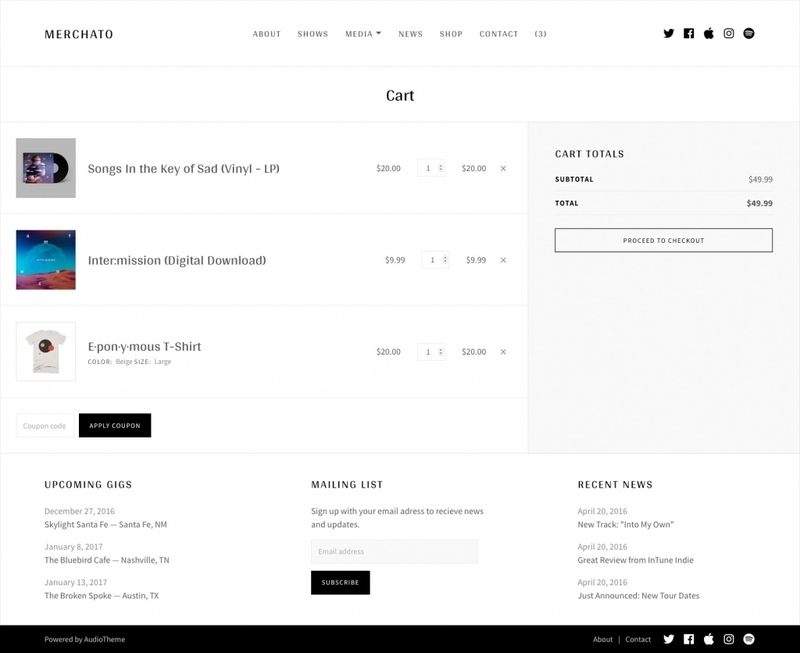 In addition, you can enter purchase links to let your fans know where they can buy your music. We help guide you through the process to create a dynamic, user friendly discography. The music archive, or discography, presents your albums, singles, and EPs all on one page. Like the gig archive, a custom menu can be created to organize your music by album, EP, and single, or add external links. 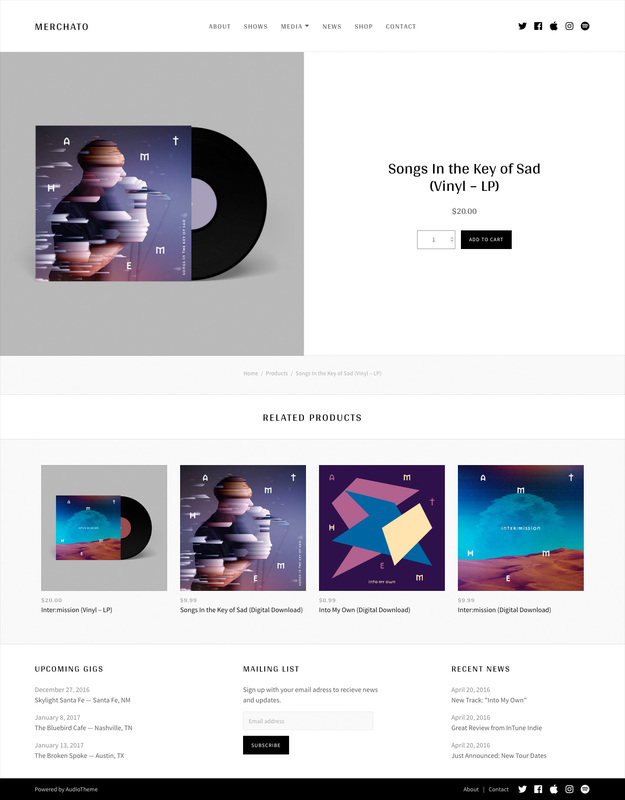 Single record pages display tracks in a clean and simple tracklist, allowing fans to listen and purchase your music. Alternatively, you can choose to display music and playlists from other popular music services such as SoundCloud, Spotify, Bandcamp, and many more. Each track links to an individual page to view lyrics, download options, purchase links, or additional information about your songs. Managing and displaying your own video library is a breeze with the AudioTheme plugin. Add your latest YouTube, Vimeo, or other supported video service by simply providing a URL. 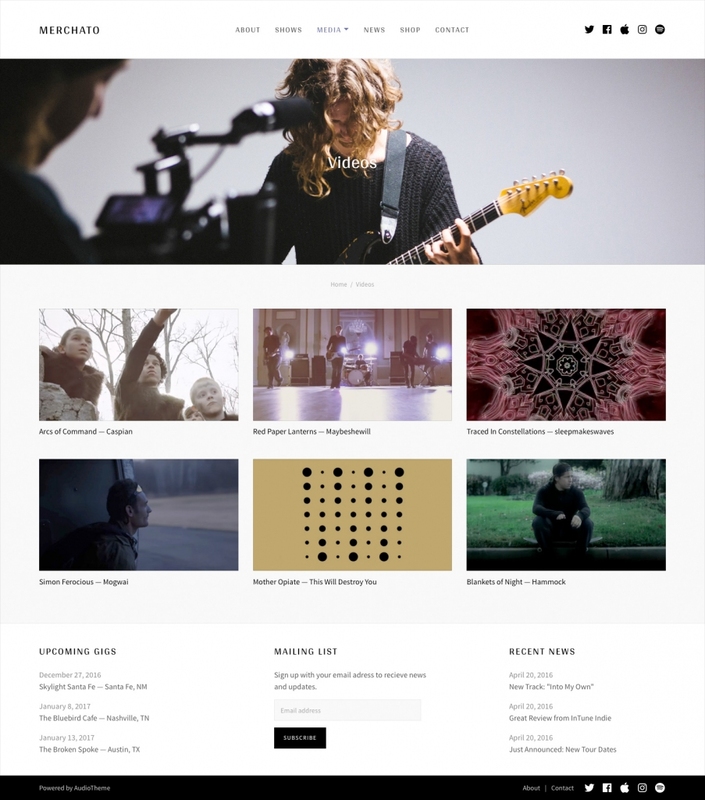 Merchato will handle the embedding and responsive video support. You can set your own preview image for greater control or automatically fetch a video thumbnail from your video service. Merchato will handle the embedding and ensure videos display nicely across all devices. 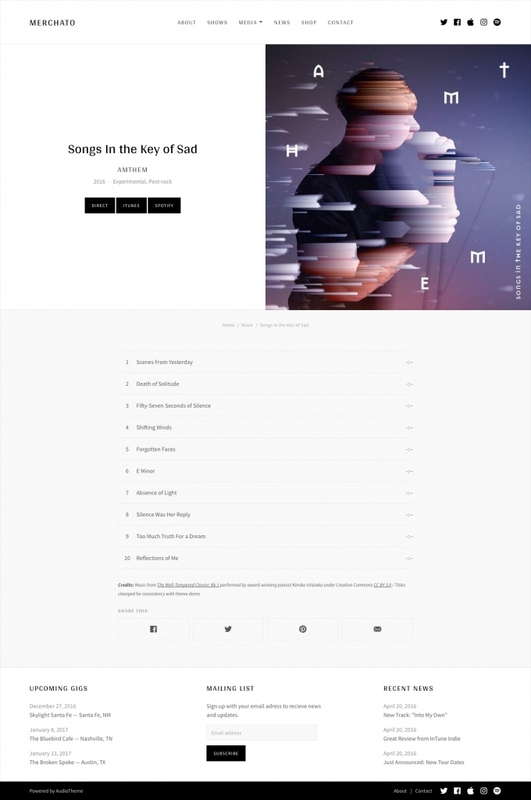 Merchato provides support for a number of AudioTheme widgets, which can be used to highlight a list of upcoming gigs, feature a video, or showcase your latest record or favorite track. Instantly engage fans with a large header image or video on the your homepage! Upload your own image or video, or use a YouTube video URL and watch your homepage come to life in either a large banner or paneled layout. Customizing the header media, title, and call-to-action content are all done in real-time using the Customizer! 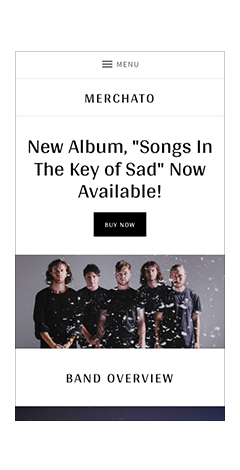 One of Merchato’s defining elements is the featured content section on the homepage. 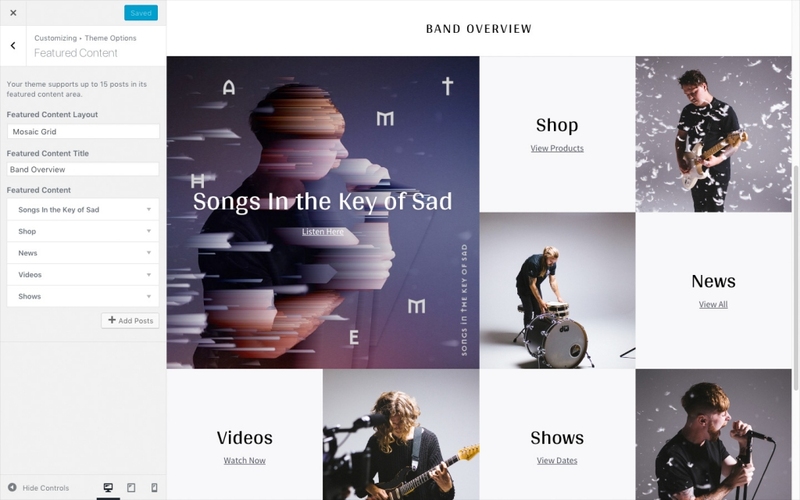 Choose multiple posts, pages, and products to featured in either a mosaic grid or block grid layout. Use the Customizer to add a site title and tagline, upload a logo, choose an accent color, and more! Add a some personality to your site by choosing an accent color that better expresses who you are. Using the handy color pickers in the Customizer, you can tweak the colors of your site in real-time, no code required! Beautiful fonts create a better browsing and more expressive viewing experience. With Merchato, you have the ability to customize your theme with 30+ hand-picked Google fonts. If you’re a Typekit customer, we’ve got you covered there too. Fonts are also displayed in real-time, no coding required! Ever wish you could add a logo to your site? Well, now you can with Merchato! You have the option to set a favicon as well. 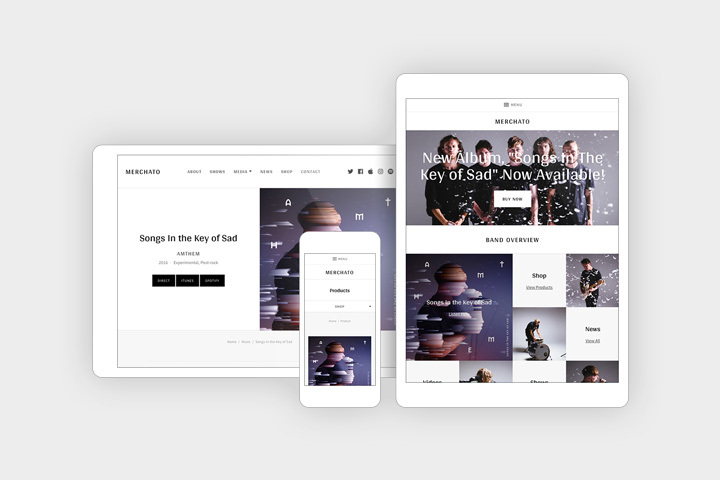 Merchato features a flexible, responsive design, meaning your site will scale to fit any screen size, from desktops down to mobile phones. All pages and features have been optimized to work on every device. Comes with a child theme so if you want to make any code changes they will not be overwritten when you update the theme. WordPress is used all over the world and translated into many languages. Each theme has been optimized for easy translation and comes with .pot language files. Widget is a fancy word for tools or content that you can add, arrange, and remove from the different areas of your site. 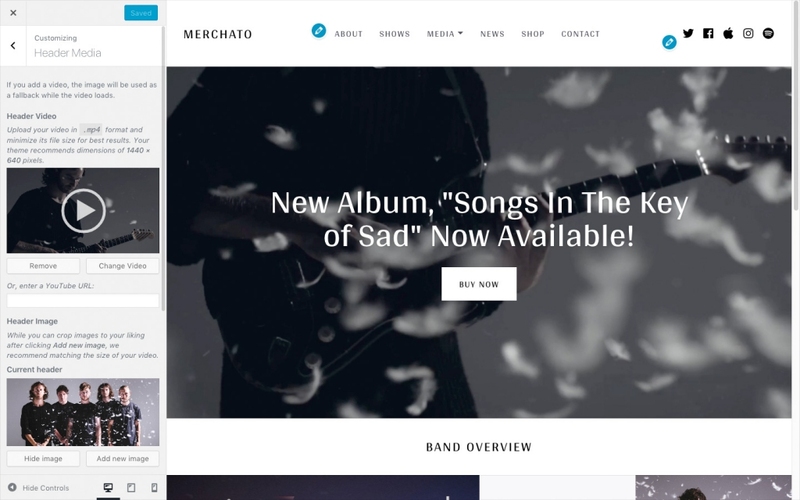 Merchato provides a three column widget area in the footer where you can showcase important content and information on each page of your site. Social media icons can be displayed on your site in different ways, allowing visitors to quickly access your social profiles like Twitter and Facebook. Add icons to Merchato using only a URL with a special custom menu. Enhance the way users find their way around your site with breadcrumbs. Merchato has built in support for WooCommerce breadcrumbs and the Breadcrumb Trail plugin. Footer credits — also known as footer text — refers to the text shown at the bottom of a website. Learn how to customize the footer credits in Merchato. Merchato comes with support, documentation, and a theme guide. Everything you need to know to start adding content, products, gigs, records, videos, and more are covered.